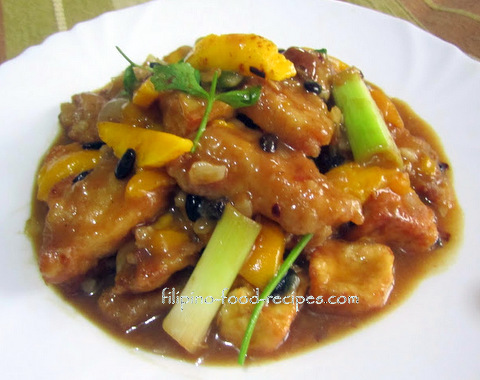 Fish and Tofu with Tausi and Mango is an explosion of flavor. It is savory with a hint of sweetness from the mango and oyster sauce, and the chili flakes or siling labuyo gives it a nice bite to it. The salty tausi mixes with a little sweetness, and finished off with a thickened sauce with a little kick from the Siling labuyo (thai chili pepper). I am not really a fan of Tausi or fermented black beans because it is pungent, but a friend convinced me to try it, saying I would hardly smell it when cooked - so I did. This turned out to be a great dish, that my picky-eater son gave it a two-thumbs-up! 1 Fry the tofu until golden brown, set aside. 2 Coat the fish in beaten egg, dredge in the breading mix and fry, set aside. 3 On a separate pan, saute the onion, garlic and ginger in a little oil. 4 Add the tausi, leeks, oyster sauce, and water to meld all the flavor, bring to rolling boil. 5 Add the mango and chinese celery and chili flakes. 6 Thicken the sauce with the slurry. 7 Add in the fried tofu and fried battered fish, bring to a boil. 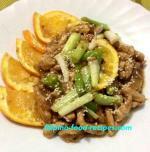 8 Serve hot with steamed white rice and enjoy!